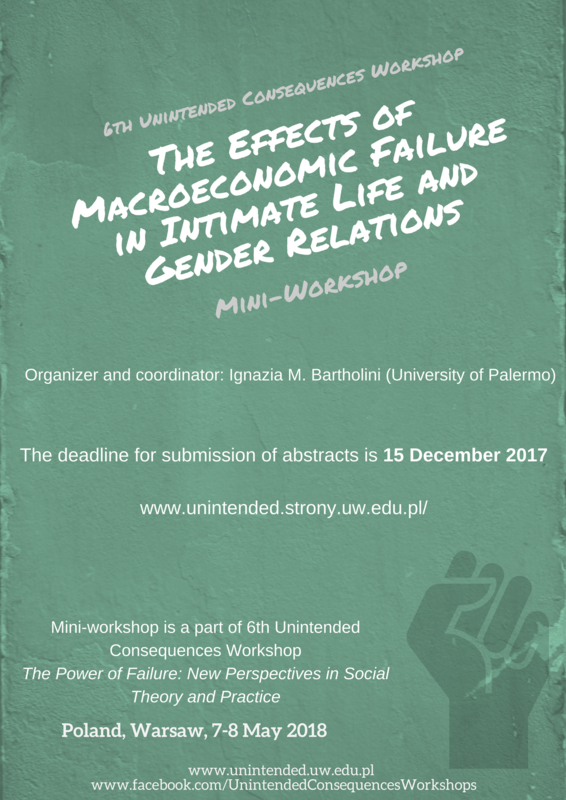 Mini-workshop is a part of 6th Unintended Consequences Workshop “The Power of Failure: New Perspectives in Social Theory and Practice“, Poland, Warsaw 7-8 May 2018. The last decade crises have analyzed the dynamics of failure, but do not have really take the effects of the economic crisis in the “gender relations” and in “intimate life”. What is the relationship between failure and social changes in family-system and the increase in episodes of gender violence? Can these last ones be considered as the effects of a ampler failure that invests the equilibriums between genders? Why do women who have not only demonstrated their ability to emancipate but also to deal better with difficulties in the public sphere, suffer the effects of male failures, enduring their consequences, sometimes even to death (feminicide)? The power of failure is detectable in the social life in its entirety, but above all, in the private dimension of life, where personal failures, which do not depend on individuals, but on a larger economic system, turn into mechanisms of redeeming identity for men and women’s subjection. For this reason, the mini-workshop “The Effects of Macroeconomic Failure in Intimate Life and Gender Relations”1, proposes to depart from the traditional way of discussing failure and the power of failure as something out of the ordinary and paradoxical, and to bring contributions that deal with this topic in terms of everyday life and practice of gender violence in intimate life.